I have done the above entry. My favorite Neutrogena® Hydro Boost™ product will be the Night Concentrate Sleeping Pack. I am a big fans of sleeping mask and also hydrating skin care products. My favorite Neutrogena® Hydro Boost™ product will be the Neutrogena Hydra Boost Essence. My favorite would be Neutrogena® Hydro Boost™ Night Concentrate Sleeping Pack because girls cannot live without MASK, need mask to prevent aging LOL. my favourite is Neutrogena® Hydro Boost™ Night Concentrate Sleeping Pack because the effect is great and awesome i super like to use it. I have never tried this product before think Neutrogena® Hydro Boost™ Night Concentrate Sleeping Pack will be my favourite due to the good feedbacks of it . 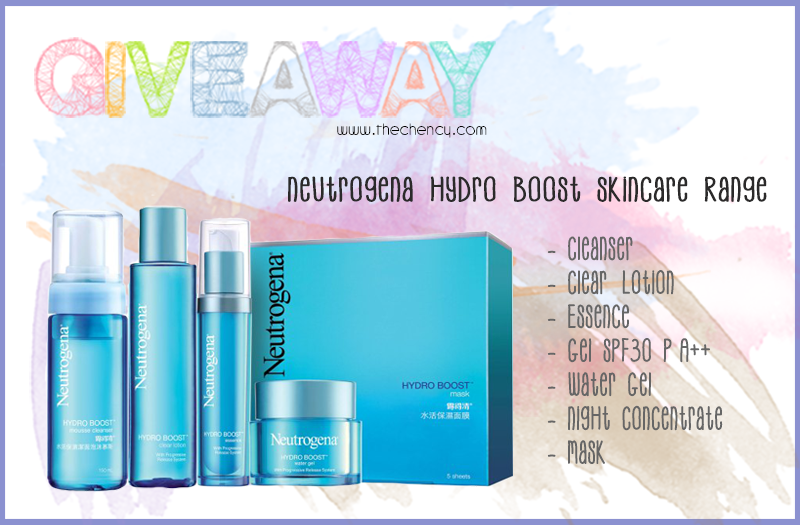 Hi Chency, my favourite would be the Neutrogena Hydro Boost Mask as I am a 'mask girl' and just love using masks on a weekly basis. I haven't tried this one out yet but have heard many good reviews about it. Hopefully I will have the chance to try it out :D Thank you! Hi Cheney, thanks for organizing such a great giveaway. Anyway my favourite item from the range would be Neutrogena Hydro Boost Water Gel.